Great Economic Thinkers presents an accessible introduction to the lives and works of the most inﬂuential economists of modern times. 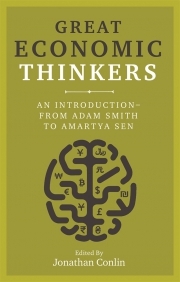 Free from confusing jargon and equations, the book describes and discusses key economic concepts – from the role played by the division of labour to wages and rents, cognitive biases, saving, entrepreneurship, game theory, liberalism, laissez-faire and welfare economics – showing how they have come to shape how we see ourselves and our society today. All of the thirteen economists featured – Adam Smith, David Ricardo, John Stuart Mill, Karl Marx, Alfred Marshall, Joseph Schumpeter, John Maynard Keynes, and Nobel Prize winners Friedrich Hayek, Milton Friedman, John Forbes Nash Jr, Daniel Kahneman, Amartya Sen and Joseph Stiglitz – have had a profound inﬂuence on our attitudes towards market intervention and regulation, taxation, trade and monetary policy. 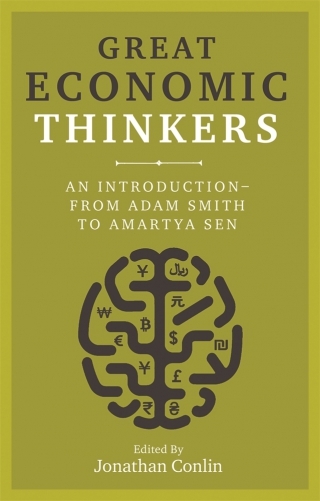 Each chapter by a noted economics historian combines a biographical outline of a single thinker with critical analysis of their contribution to economic thought. The book features an introduction by historian D’Maris Coffman. If you’ve ever wanted to ﬁnd out more about the theorists who gave us the ‘invisible hand’, Keynesianism, ‘creative destruction’, behavioural economics and other concepts, this book is the perfect place to start. Jonathan Conlin is Senior Lecturer in History at the University of Southampton. His books include Tales of Two Cities: Paris, London and the Making of the Modern City (2013), Evolution and the Victorians (2014) and Adam Smith (Reaktion, 2016).